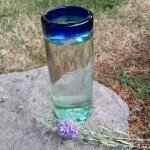 Posted July 17, 2015 by Heather Michet & filed under DIY, Medicinal Plants, Recipes. Skyler is not your average, or typical, 14 year old guy. He is very knowledgeable about good healthy food. He eats this great food! (Big thanks to his wise and brilliant mother who knows her chops around a kitchen and a garden.) He snowboards, okay that’s pretty typical for teens around here. But more unique is his relationship with lavender. He loves it. One day this summer, he was really jonesing for a soda but he wasn’t going to succumb to the sugary, syrupy commercial types that many Americans are addicted to. Nor would the likes of any of those be found in his home refrigerator. As he dreamily wished for something to quench his thirst and fulfill his desire for some bubbly in the mouth, he said to his mom: Does anyone make a Lavender Soda? Wouldn’t that be the greatest drink? I would love to have one of these!! Wishes do get granted, Skyler, and dreams do come true. Here’s the recipe for your Lavender Soda. Enjoy it and let me know how you like it. Add Lavender Sugar to a 16 oz. glass. Top with sparkling water and stir well to combine. Adjust the amount of Lavender Sugar to your taste. Sip and savor your own special soda, Skyler. I think your mom will approve. This lavender soda is a great suggestion Heather! Lavender is such a great gift from nature. Its soothing effects have been known for centuries. One factoid that did surprise me: lavender blocks the beneficial effects rosemary exerts on memory and cognition. Thank you, Francois. I so appreciate your reading the post and commenting. The bonus is what you shared re. lavender blocking rosemary’s effects. Thank you for engaging and continuing my education!